Home Free Casino Games Slots Shoot! The Shoot! 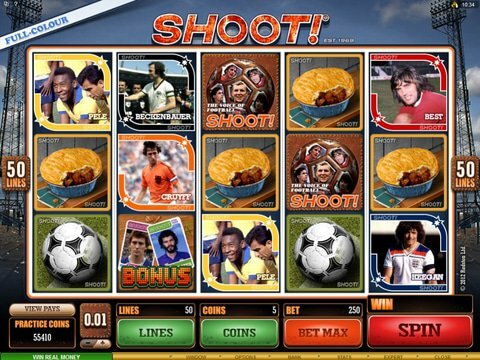 slot machine from Microgaming pays tribute to the game of soccer (football in other parts of the world) across five reels and 50 paylines. The graphics are quite realistic, and there's definitely a lot of fun to be had. You can try it out right here on this page with the Shoot! free play slot demo that is available to you with no download and no registration required. What's more, you can even review it from your mobile device as long as it is Flash enabled and you have access to the internet. When it comes to slots free, this one offers up some of the best action out there. You'll find that you can spend anything from a penny to $100 per spin, and you'll also be able to win up to $20,000 at all once! The Title Logo is the wild and will act as other icons to provide you with wins, and there are tons of other features including the Shoot! Bonus, the Trade 'Em Round, the Magazine Bonus, or even the Free Spins round during which you can win a random two-digit number of free spins that is generated on the scoreboard. There's really nothing else like it, and you won't get bored anytime soon. While this particular title might be packed with action, there are better choices if you want to play for real money. Another fun soccer-based game is Top Trumps Football Legends from Playtech. This one boasts tons of special features that are sure to keep you entertained, and one of the bonus rounds will even allow you to pick from legends to win some huge cash prizes. Free spins are available, and you can get 10 with 4x multipliers, and the top jackpot here is a handsome half a million dollars.